With Halloween not-so-sneakily sneaking up upon us, I am scrambling to get into the holiday spirit by making some crafty, last-minute decor! 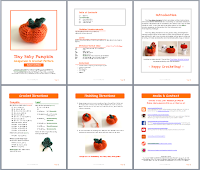 Thankfully, I am excited to mention that I have designed a nifty solution: a Tiny Baby Pumpkin! 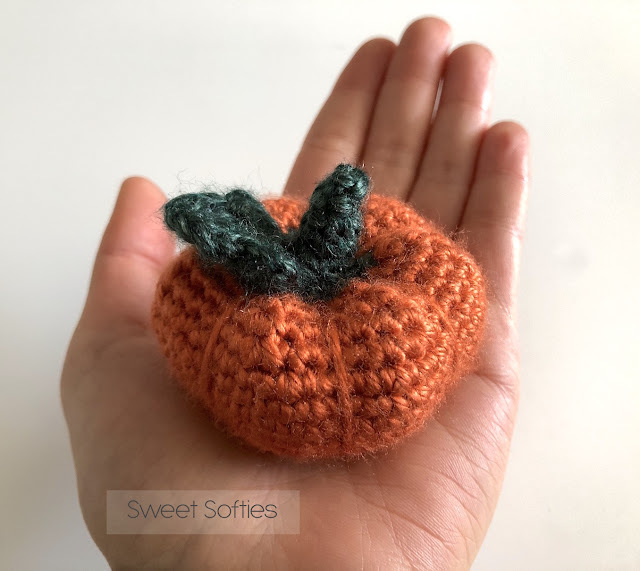 The Tiny Baby Pumpkin is perfect as an accessory for dolls or as a toy for little hands to hold. 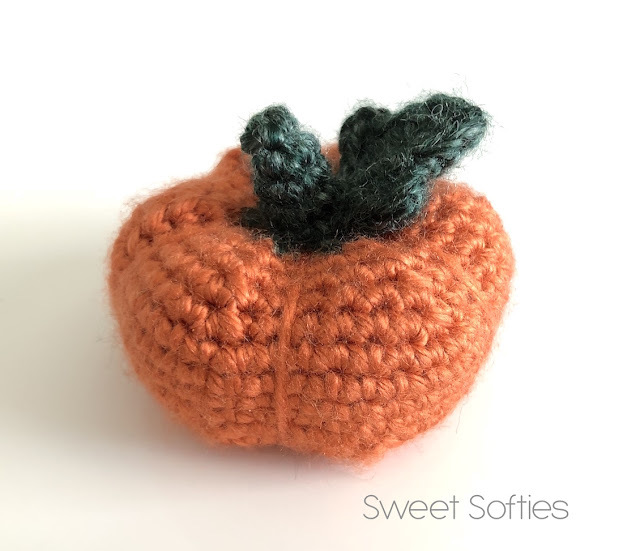 It can also serve as great décor for the Fall or Autumn seasons, as it’s perfect for the Halloween and Thanksgiving holidays! 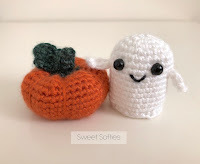 This miniature pumpkin is a very quick, easy, and beginner-friendly project. Since it’s so fast to make, it serves as a great, last minute DIY gift! Any crochet enthusiast will be able to whip up an army of these as beautiful and handmade gifts, toys, or décor! 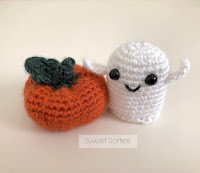 By the way, if you haven't done so already, please check out the Tiny Baby Ghostie Pattern as well! 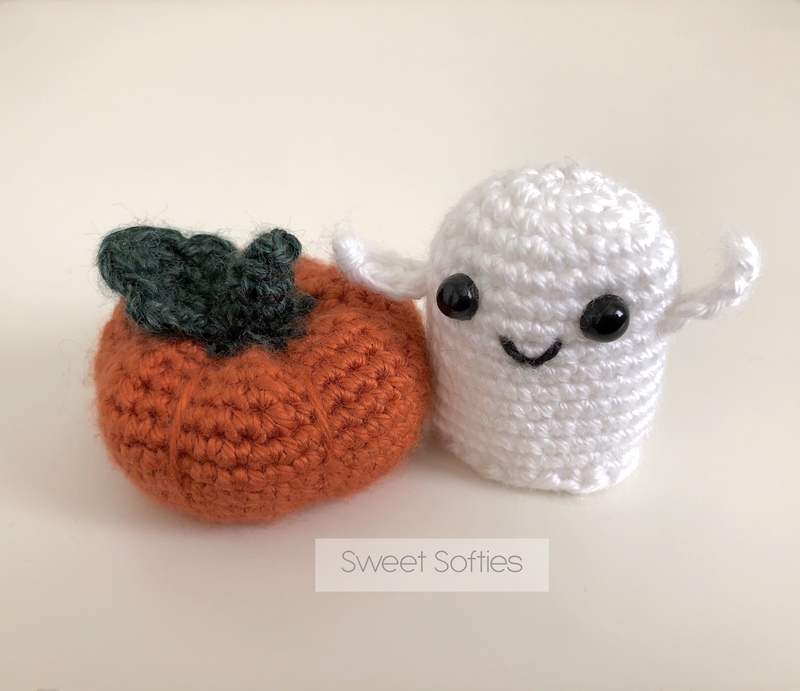 The ghostie and pumpkin go pretty well together, methinks! Beginner. Requires familiarity with stitches used (below), changing color, and sewing parts together. Start with the pumpkin color (orange). Switch to the stem color (green). Stuff the pumpkin firmly but be careful not to stretch the stitches. Sl st in next st. Then, fasten off and weave in the ends. Start with the leaf color (green). R2: In the first sc… Sc 3. Then, ch 1. In the second sc… Dc, ch 2, and sl st in the same st. In the third sc… Sc, hdc, and dc. Then, ch 1. In the fourth sc… Dc, hdc, and sc. In the fifth sc… Sl st, ch 2, and dc. In the sixth sc… Ch 1, and sc 3. Fasten off with a long tail for sewing to the pumpkin later. 1. 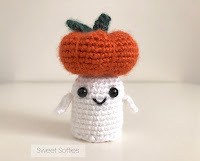 Using orange yarn and a yarn needle, pull yarn through from the bottom of the pumpkin to the base of the stalk. Pull tightly to create a crease. Repeat 5 more times so that there is a total of 6 creases. Fasten off, and weave in the ends. 2. 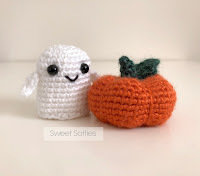 To attach the leaf, use the long yarn tail and a yarn needle to sew it onto the base of the pumpkin’s stalk. Fasten off, and weave in the ends. Congratulations on finishing the Tiny Baby Pumpkin!